An original letter of correspondence between brothers and business partners Sydney Octavius Chase and Joshua Coffin Chase. 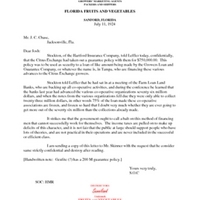 Topics discussed in the letter include the Florida Citrus Exchange's guarantee policy with the Hartford Insurance Company, the freeze on co-operative associations in 1923, and the burden placed on taxpayers for this type of financing. Original letter from Sydney Octavius Chase to Joshua Coffin Chase, July 11, 1924: Chase Collection (MS 14), box 7, folder 14.11, Special and Area Studies Collections, George A. Smathers Libraries, University of Florida, Gainesville, Florida. Digital reproduction of original letter from Sydney Octavius Chase to Joshua Coffin Chase, July 11, 1924. Stockton, of the Hartford Insurance Company, told Leffler today, confidentially, that the Citrus Exchange had taken out a guarantee policy with them for $750,000.00. This policy was to be used as security to a loan of like amount being made by the Growers Loan and Guarantee Company, or whatever the name is, in Tampa, who are financing these various advances to the Citrus Exchange growers. associations are frozen, and frozen so hard that I doubt very much whether they are ever going to get more out of the seventy six million than the collections already made. It strikes me that the government ought to call a halt on this method of financing men that cannot successfully work for themselves. The income taxes are pulled on to make up deficits of this character, and it is not fair that the public at large should support people who have lots of theories, and are not practical in their operations and are never included in the successful or efficient class. I am sending a copy of this letter to Mr. Skinner with the request that he consider same strictly confidential and destroy after reading. Chase, Sydney Octavius. 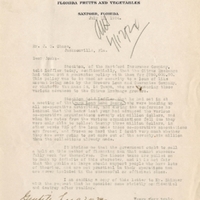 “Letter from Sydney Octavius Chase to Joshua Coffin Chase (July 11, 1924).” RICHES of Central Florida accessed April 22, 2019, https://richesmi.cah.ucf.edu/omeka/items/show/1597.